This is my 3rd and final time helping out at Safety Town. Safety Town is run by the city of Roswell. They set up a mock town with buildings, streets, and crosswalks in one of the gyms at Hembree park. They also have a firetruck and police car in the parking lot. Then they have any preschool, prek, and kindergarten classes around the area come and participate in this program. Both Talmage and Hayden's prek class did this. I didn't help in Talmage's prek but with his kindergarten class, and I went and help with Hayden's prek and kindergarten classes. I wish I would of brought my camera to take pictures but I didn't. They have 4 different groups rotate around the different areas. The areas are talking with a lady about strangers and then touring the police car, touring a firetruck and talking with firemen about fire safety, and the last area is in the gym with the mock town and trading off between pedestrians and riders. The pedestrians are split up into small group of about 3 people and they walk around the town in the cross walks and sidewalks while their leaders (volunteer parents which is what I did) walk with them and talk about traffic and road signs and visiting and talking about the different buildings. Then pedestrians switch with the riders and they get to get to ride in big wheels on the mock street. The leader is still with their group and help them with stop signs and traffic lights, and help them turn corners and stop before running into the big wheel in front of them. Then the whole group comes together again and the director reviews what the kids have learned. 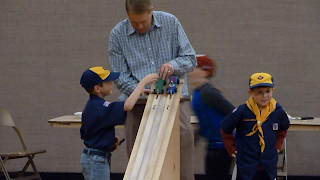 It is a great program and the kids just love it. I am sad my children are all grown up and will no longer be doing this. 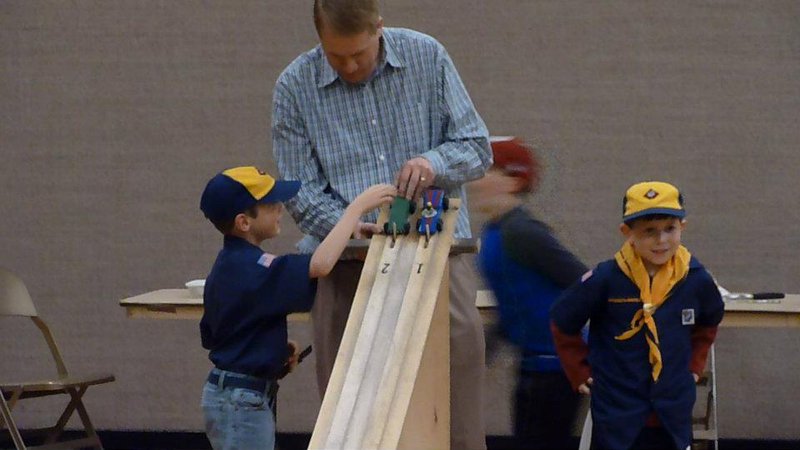 On February 22, Talmage participated in his first Cub Scout pinewood derby. 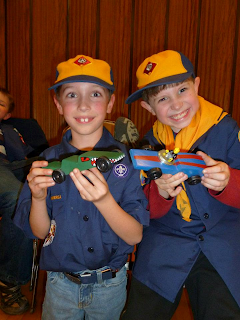 He had a great time designing his car and then Jon cut it out. Talmage picked out the colors and dad spray painted it. He placed a Lego guy to be the driver of his car. So Talmage and Lorin's first race was between each other. Talmage won. Talmage won all of his races and Lorin won all his except for his first one against Talmage. Then they had Talmage and Lorin race one last time and this time Lorin won. Then they raced again and Lorin won again. 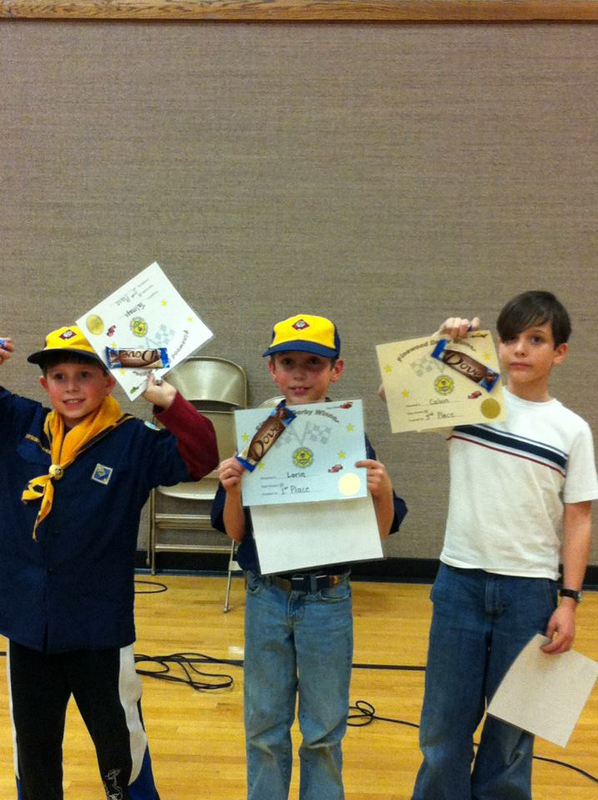 So Lorin took 1st place, Talmage took 2nd, and Calvin took 3rd. All these boys were Wolves and this was all of their first time and it was Calvin's first Cub Scout activity since he just turned 8 3 days before. Talmage was very happy for his cousin Lorin and told him if I had to loose I am glad it was to you. Of course, Jon and I gave Talmage the whole speech of just have fun and it doesn't matter if you loose just have a great time. I as a mom was just hoping he would at least win one race. 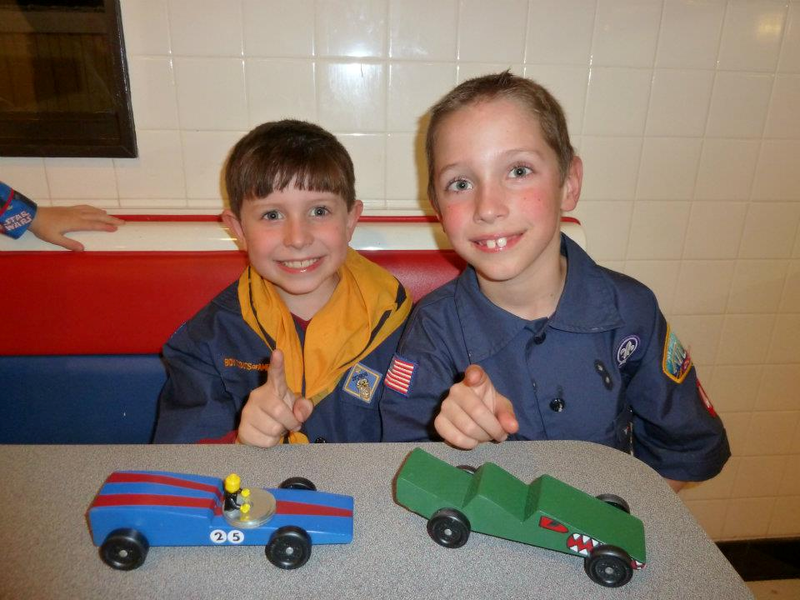 After the race, the Tady's, Bugees, and us went to Dairy Queen to celebrate. O.K. we really went there because whatever den was in charge of bringing the refreshments for some reason didn't bring them or tell their den scouts to bring them. It was a fun night. My baby, Hayden turned 6 on Feb. 29. Since Hayden's birthday was on a Sunday, we went to the Tellus Science Museum and then to the restaurant of his choice on the way home which was Mc Donald's. Then on Sunday we had him open his presents. He has been wanting a Nintendo DS lite ever since Talmage got one for his birthday last October. So I search Craigs list since Hayden didn't want the newest 3D DS I thought I could get one at a great price. I found a person nearby who was selling theirs along with 9 games 2 of which I know he would really love. It also came with a case and 2 chargers and 2 extra stylus. The boy who used to have it kept it in great shape you would never know it was used. Needless to say Hayden was thrilled when he opened DS and all the games. Basically the same price I paid for the whole lot is the same price I would of paid for just the DS at the store. So I am pretty proud of myself for the great find. The secret is to start looking early. I had bought his DS at least a month before his birthday. Later in the week we had the family birthday party. Hayden doesn't really care for cake so he opted for chocolate silk pie. Yumm!! Our cell phone comany announce a super deal on the radio that Jon just happened to be listening to while taking Brenton to seminary. They were giving free android smart phones with a 2 year contract. Actually, the phone wasn't free. It was free after the 2 rebates. Since my contract was up and I have been using a flip phone from one of Jon's old employees that hasn't been with the company for going on 2 years now, Jon thought what a great time to upgrade. I didn't mind my flip phone. I rarely use my cell phone. I am not a phone person. I refused to text people. Mainly because I was not about to do the AaBbCc thing since my phone wasn't a texting phone. So Jon and I went to the store to check things out and I walked out with my first smart phone. I am still not a phone person or a text person. I do prefer to talk on the phone vs text. I only text when I am picking up Brenton so he know's I am here and waiting for him only because if I call he still might be in Scouts or Young mens or another activity that I don't want ringing to disrupt. The only thing I don't like about smart phones is the fact that people are on theirs way to much and not communicating with people around them. I have been to numerous activities and see lots of people on their phones instead of having converations with people right next to them. It is really sad and I refuse to be one of those people. That doesn't mean I don't check emails or facebook or look up something or things like that. I just don't do it at activities with other people like Relief Society, school class parties or volunteering, and never during church meeting. If I have to check my phone to see if I missed a call or text because I often have it on vibrate, I make sure I do it as quickly as possible. I don't want my kids to be one of those kids who are on their phones texting the kids right next to them. I want them to talk with them face to face. So hopefully they will look to Jon and I and see that we are rarely on our phones while we are out and about and they too wont be on their when they get a cell phone.